Having cutesy photo of YOU and YOUR Daughter is not going to cut if you want to build YOUR Business leveraging a social media platform like Facebook. Cute and Funny are two things that don't sell when it comes to your Profile on Facebook. Here I show you step by step what you need to do to Position yourself like a PRO and have people curiously wondering what it is that you know, what you're doing, and what you are all about! Secret Sauce #1: Take a look at your Profile Picture. First thing people's gaze goes to is your profile picture. It should reflect a person who is serious about what you do! Your photo should be clear, uncluttered, headshot of you. It doesn't need to be a professional headshot. Nowadays, you can take a nice photo of just yourself with your phone. Don't have a profile picture of your adorable pets or even one with your spouse or a photo with your kids. Secret Sauce #2: Have your cover photo be congruent with what you represent. What is the most important message that you want to share with the world? Are you seeing that time freedom to be with your family? Show a picture of your family! Chasing after Location Independent Lifestyle? Post a photo of your jet setting around the world and working from your laptop! Do you have Dreams and Passions that you are running towards? Share your best vision board in your cover. Whatever it is that you decide to put up there, make sure that the visual matches your vision, mission, or whatever it is that your message may be! For the remaining Secret Sauces, watch the webinar that I presented on this topic alone! It's amazing seeing my students projecting themselves beautifully on Facebook utilizing the skills that they have acquired! Look below. 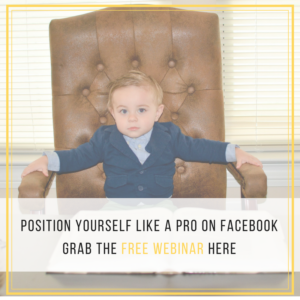 Click on the image above for access to a webinar that I hosted detailing the exact steps to Position Yourself Like a PRO on Facebook. I promise, you won't want to miss this Bonus Training! Checkout the Webinar where I show ‘over the shoulder' screen share How to be a PRO!!! Be an insider! Subscribe to my newsletter by clicking below and I'll send you my 5 Best Tips to Rock Out Your Online Biz. 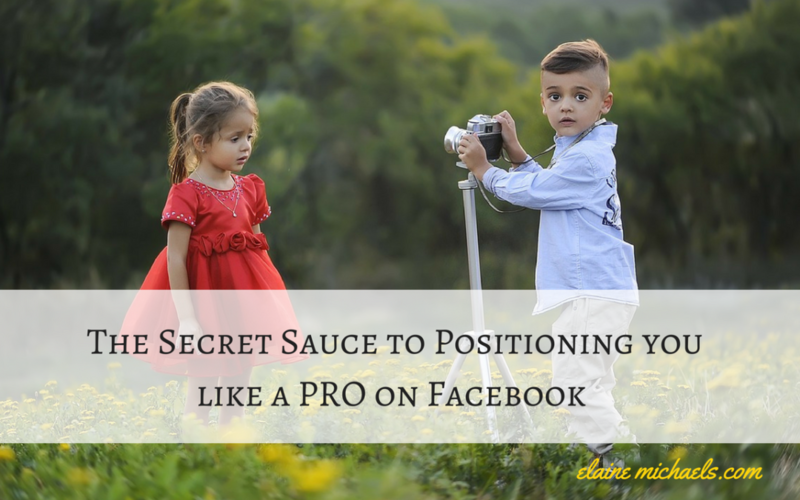 These are all great strategies for positioning yourself as a pro on Facebook. It all starts with your profile picture. These strategies are powerful yet simple and so often overlooked by a lot of people. People will judge you just from your profile picture, so why not put your best foot forward and make that great first impression. Your profile picture should not have your company logo or. name anywhere on it. You want to market yourself and your name. Great training Elain, thanks for the share! This is very informative, especially the strategies that you have outlined.. great job!! Great tips. Really simple strategies thank you. I will be sure to try and join some of your webinars too. Thank you for sharing these awesome tips. I have been using the same profile picture since I started my Facebook page for my blog. I think it is time to do a revamp! Great info on a common mistake people make. Looking forward r4ading more as well as to the webinar. Good tips! Will need to re-evaluate my page and see if I’m following what you are suggesting. These are smart and easy ways to establish your personal brand. Who would have thought back when Facebook was invented that it would become such an important marketing tool? These are some great tips. I need to work on my profile photo. I really love the main photo of this article! I really want to start updating my Facebook page and these tips, will help me out loads. Such great thoughts! Whether someone is starting out or just needs a refresher, these are really important to consider for Facebook! 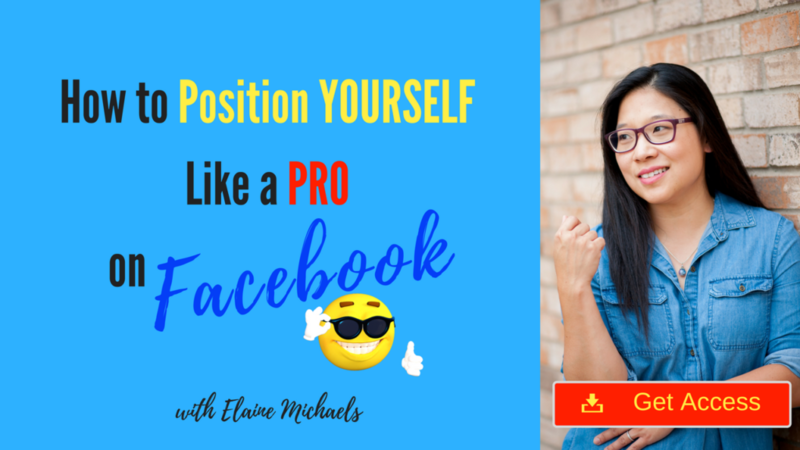 Great tips for looking like a pro on Facebook. I agree that profile picture is very important. Thank you for sharing.